Top 10 Best Upcoming Fall 2015 Movies to Watch | Nerd Much? 2015, in a truly general sense, has been defined as the year of hype and revivals. An excellent Mad Max film came down the pipeline, a new Avengers film hit the theaters, and super-franchises such as Star Wars and Bond drew closer to their tentative release dates. Now, as we move into the fall stretch of the year (which some might term the Oscar Bait season), many of these fabled projects are coming to fruition, and they look spectacular. 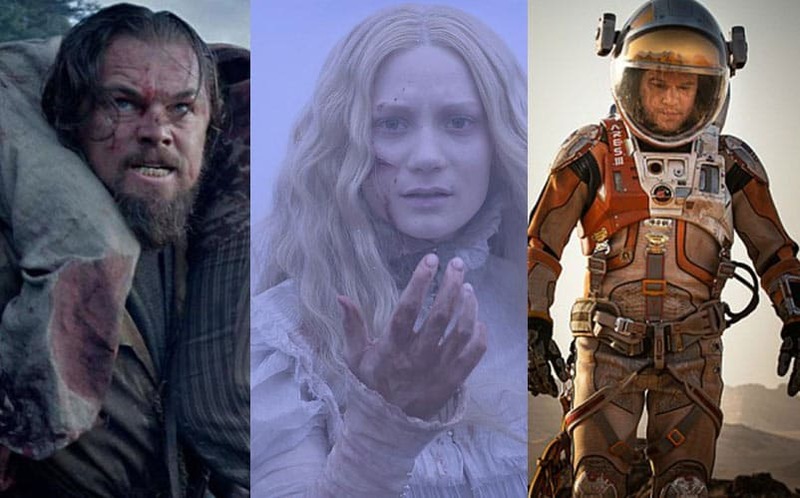 From Leonardo DiCaprio to Matt Damon to Jessica Chastain, the upcoming fall 2015 movies have plenty of star power to help fuel our interest in them. Here are the top 10 upcoming 2015 movies to watch for the remainder of the year, and a few reasons to get excited when you see the opening credits roll. Leonardo DiCaprio’s life has been one string of stolen Oscars after another, but if any film has the potential to earn him his trophy, it would be The Revenant. Based on the true story of Hugh Glass, a trapper left for dead by his party in the wake of a bear attack, it relies on the expert filmmaking employed by the director of Birdman and the all-star cast of Leonardo DiCaprio, Tom Hardy, and Will Poulter to spin its tale of vengeance. Be ready for gritty treks through open country, incredibly long takes, and fur jackets. Plenty of fur jackets. In the wrong hands, a Shakespeare adaptation can be a disastrous — albeit ambitious — attempt to modernize time-honored and classic material. When done well, however, we end up with a project like Justin Kurzel’s Macbeth, which stars Michael Fassbender, Marion Cotillard, and other heavy hitters. It’s a stylish, violent take on the original tale, and early reviews from its European release suggest that it’s a guaranteed winner in the adaptation arena. Not everybody flocked to the theaters to see the first Maze Runner film, but those in attendance were able to witness the birth of a fresh and unique dystopian tale with the power to rival The Hunger Games. Now that the original film’s motley crew has broken out of an engineered maze and its flesh-eating gauntlets, they’re thrown into a far more unpredictable and broken landscape, and their enemy is more aggressive and lethal than ever before. At the very least, this title has a bigger budget behind its name than the original film, and should be able to ratchet its CGI up ten notches for the post-apocalyptic action sequences. If you’re on the fence about Scorch Trials, rent a copy of The Maze Runner and see if it’s your cup of young-adult-bloodshed tea. Sorry to disappoint, but The Martian has very little to do with little green men or ray-guns. Instead, it’s a factually-grounded survival tale set on the Red Planet, and its original source material — a debut novel by Andy Weir (which we included in our list of the Top 50 Best Sci-Fi Books to Read) — is one of the most compelling and terrifying space colonization tales in recent memory. Matt Damon stars as the leading, stranded astronaut who becomes the namesake of the film, and his presence is bolstered by the iron stare of Jessica Chastain. If the trailer says anything about its final release, then audiences are in for a gripping, truth-is-scarier-than-fiction experience on par with Gravity. After directing several episodes of Sherlock, director Paul McGuigan’s next logical career choice was to direct a Frankenstein adaptation. Fan favorites Daniel Radcliffe and James McAvoy are the leading men for the project, which puts a refreshing twist on the original tale by telling the story through the eyes of Igor, the lowly assistant. Remakes and reboots tend to be swept under the rug by most speculative fiction fans, but this project looks competently handled, more stylish than an issue of Vogue, and primed to revive the Frankenstein story with new thrills. Guillermo del Toro is a difficult man to predict, both in his choice of film projects and his storytelling concepts. Pan’s Labyrinth was a twisted and hauntingly beautiful film, and Crimson Peak, his gothic horror project several years in the making, looks equally mesmerizing. Mia Wasikowska plays a woman with an enigmatic, reclusive husband in the mountains of Cumbria, and her search for answers leads to hauntings, horrific phantoms, and one of Jessica Chastain’s most unhinged characters to date. Crimson Peak might enchant or terrify the viewer, but if del Toro’s past projects are any indication, it will likely do both. Oddly enough, Spectre seems to have emerged from the woodwork without excessive media attention or fanfare. Daniel Craig’s string of gritty, steel-eyed Bond portrayals have come to a head with this project, and pit 007 against one of his most secretive and powerful enemies to date. The film is being directed by Sam Mendes, who put his magic touch on 2012’s Skyfall and hopefully spared some magic for the coming installment. Regardless of where the plot takes us, we’re guaranteed exotic gadgets, rampant Bond charm, and Daniel Craig’s soul-piercing stare. Films modeled after the life of an icon have mountains of pressure on their shoulders, and Steve Jobs is no exception. Starring veterans Michael Fassbender, Kate Winslet, Seth Rogen, and Jeff Daniels, the movie looks shockingly candid and direct in its presentation of the Apple guru. Steve Wozniak, an infamous acquaintance and business partner with Jobs, has expressed his personal amazement and awe about the film, which is a good omen for waiting viewers. Prepare yourself for a dose of corporate shenanigans, visionary arrogance, and one of the best character studies this year. Tom Hardy and Emily Browning in one film? Sign us up. Legend tells the story of two infamous brothers, Ronald and Reginald Kray, who had one of the bloodiest street crime streaks in London (or perhaps world) history. Initial reviews seem polarized about the film, which also happened with director Brian Helgeland’s other projects Green Zone and Man on Fire. The story alone is fascinating enough to warrant a viewing, however, and the star power behind the upcoming fall movie makes it too tempting to pass up. Pan is going to be an odd film. Not because it will be mishandled or poor, necessarily, but because it features so many fantastic actors and a director who previously worked on Hanna and Atonement, which are both far from the tone and plot of Peter Pan. It looks visually striking, dramatically engaging, and over-the-top in all the right ways, with Hugh Jackman’s Captain Hook serving as the centerfold for the entire affair. Pan could end up as a failed endeavor in the world of children’s tale revivals, or it could become a modern masterpiece. Only time (and Rotten Tomatoes) will tell.